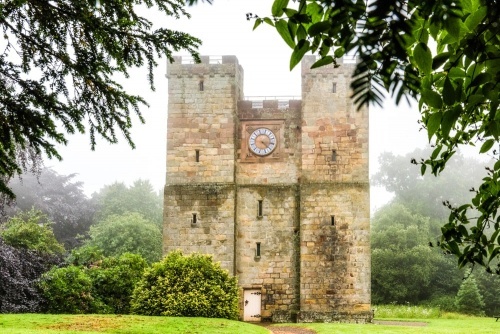 Preston Tower is a beautifully complete late 14th-century pele tower and a wonderful example of medieval construction. The Tower presents a vivid reminder of what life was like for those who dwelt in the battleground that was the border with Scotland. 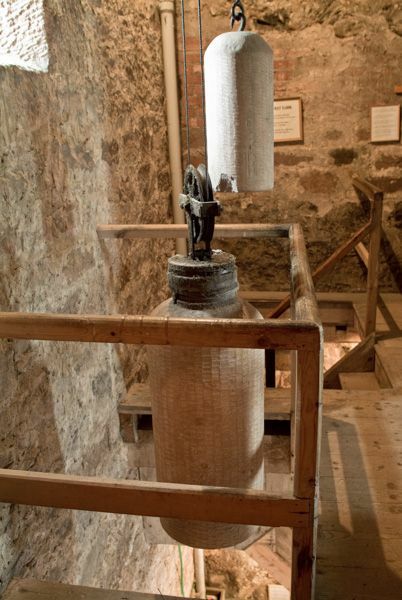 Visitors can ascend to the top of the tower for wonderful views, and see many of the original medieval rooms. A later addition is a large clock, which was inserted in 1864. You can see the 'flat-bed' clock mechanism at work behind a glass case on the second floor. The clock mechanism is similar to that used for the famous clock in the Clock Tower of the Houses of Parliament in London. The mechanism is powered by a pair of very large and heavy stone weights on ropes. Every hour the clock mechanism mechanically forces a large hammer to strike a bell weighing 1100 pounds (over 500kg). You can see the bell and hammer mechanism in one of the turrets on the Tower roof. There are a prison and guardroom on the ground floor. It was hard to see much difference between the two vaulted chambers! On the first floor is a bedchamber and living room, furnished as they might have looked around the year 1400. On the second floor is the clock mechanism and an exhibition on the Battle of Flodden. Sir Guiscard Harbottle, the owner of Preston Tower, fought and died in the battle. Other rooms on the second floor have information on the history of the Border region and Border ballads. The tower was constructed between 1392 and 1399, probably by some of the same masons who helped build nearby Warkworth Castle. The walls are massively thick; as much as seven feet in some places. Following the ascension of James VI to the throne of England in 1603, there was less need for defensive buildings in Northumberland, and part of the tower was pulled down and the stone used for other building projects. 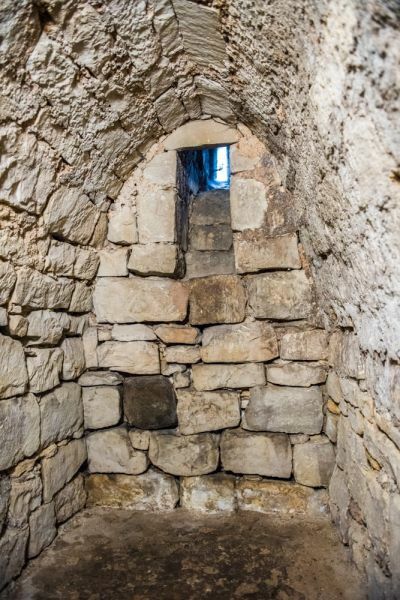 What remains is quite evocative, however; several rooms in the tower are furnished as they would have appeared in the 14th century. There are also displays telling the grim and often bloody tale of life in the turbulent border region. 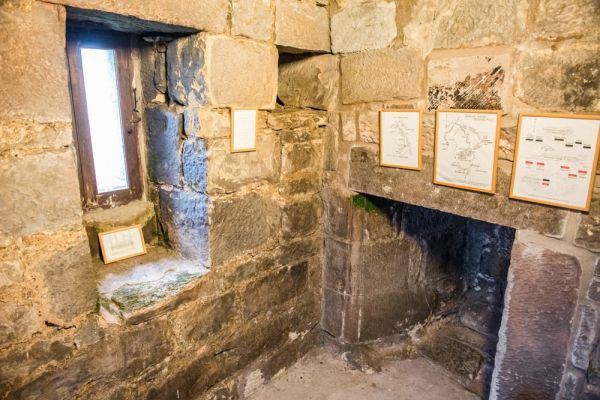 What is a Pele Tower? A pele (sometimes spelled 'peel') is a fortified dwelling. Small peles were 'one up, one down' structures with a vaulted chamber at ground level for animals and a living chamber above, reached only by a external ladder which could be pulled up when the pele was under threat. 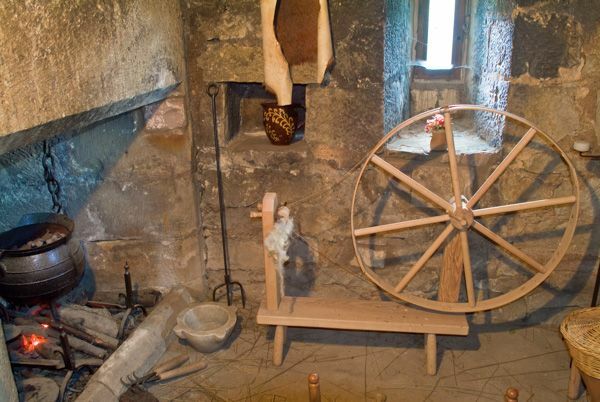 Larger pele towers resembled a castle keep, with several floors and several rooms on each floor. They often had defensive additions like corner turrets to serve as watchtowers. They offered protection for the owner and a refuge for local residents in times of trouble. 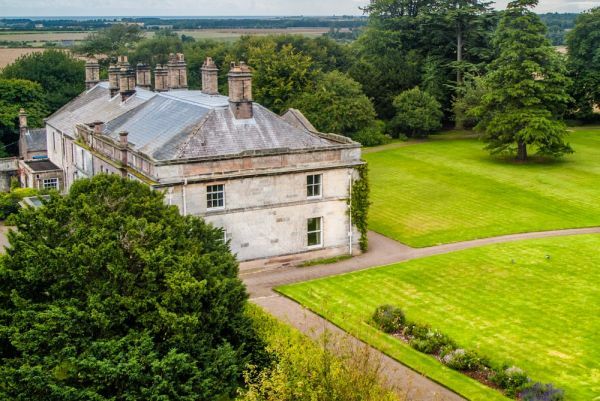 From the top of the Tower you can look down on the present manor house, built in 1802 to replace an earlier house that burned down in 1782. The house was built by Edmund Craster, but the property was later sold to AJ Baker Cresswell for his son Henry. Henry Cresswell added an east wing to the house in 1861 and it was he who installed the clock in the Tower. The house is still owned by the Cresswell family. 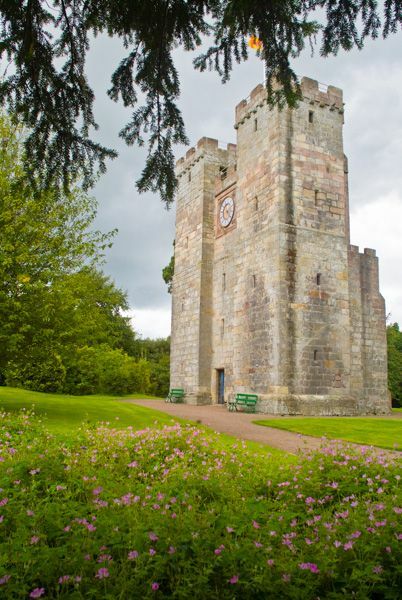 The Tower is set in large gardens and grounds featuring woodland walks. There are three short walks to enjoy. All are signposted, and there is a map of the trails inside the Tower. One walk is the Wellingtonia Way, a short circular route named for a tall Canadian redwood. The redwood was first introduced into Britain in 1860 and renamed Wellingtonia in honour of the Duke of Wellington, victor of Waterloo. The Tower is well signposted from the A1 north of Alnwick. There is a small parking area in front of the manor house. Both times we have visited there was no one there to take entrance money, just an honesty box inside the tower entrance, where you will find a scale model showing what the Tower looked like when it was built, plus more information on the history of the site. Sir Nikolaus Pevsner, the celebrated architectural historian, wrote that Preston Tower was, 'amongst the most spectacular pieces of medieval masonry in England'.